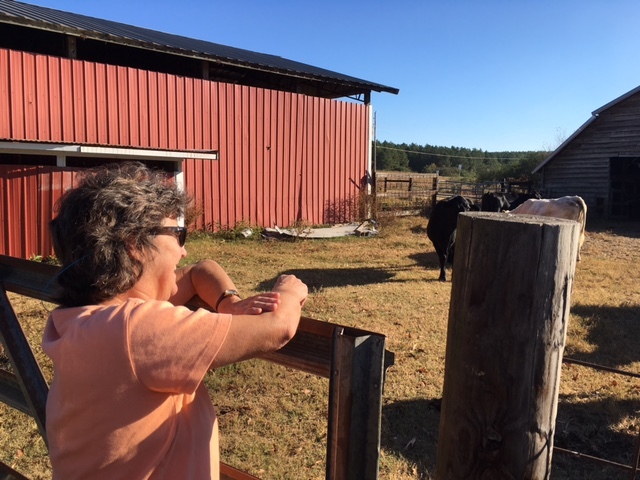 Melanie Glasscock tends the cattle on the farm that has been in her family since the 1800s. HOLLY POND/BERLIN – Melanie Glasscock is a busy lady. She is a full-time instructor at Wallace State, where she teaches biology and poultry science. In her spare time, she spends one day a week as a veterinarian. And then there's the farm. In the late 1800s Glasscock's great grandfather received a grant for a 240-acre homestead between present-day Berlin and Holly Pond, along what is now U.S. Highway 278 East. There he farmed and raised cattle, and today the family tradition continues. The property has been divided up between children and their children, but it remains in the family, and much of it is still pasture land. Glasscock's share, augmented by nearby land acquired from her mother's side of the family, is still home to a herd of cattle, along with goats, chickens, ducks, horses and a garden. Some of these might be just for fun, but the cattle are more serious business. Glasscock started with a small group of calves, which she raised to become the foundation of her herd. Now she runs a "cow/calf operation," with her adult cattle producing dozens of calves each year. A few will be kept and raised to take the place of older "retiring" cows, but most calves will be sold at market in Cullman to ranchers who will raise them for beef. Glasscock is very hands-on in a largely solo operation assisted as needed by local family members. She is close to the work, even calling a few of her cows by name while feeding them. When asked if she ever has trouble parting with her cows, she admitted that while she has learned not to be too attached to the calves, certain adults have earned designation as permanent crew members. "It might not be the best thing economically," she explained, "but they will live out their lives here." Glasscock is committed to doing business in the Cullman area. She occasionally has to venture out, but she says that Cullman is a great place for farmers to do business. "Shop local," she advises, and she means it. She buys most of her supplies in Cullman, and sells most of her stock to Cullman County ranchers. "It's good business. I mean, they're our neighbors," Glasscock insisted, as she motioned in the direction of a nearby ranch that has become home to some of her calves. With her career as a teacher and her credentials as a veterinarian, Glasscock doesn't have to do this. When asked why she does, she pointed to the issue of family heritage, but shared some more personal reasons as well. In talking about her cows and other animals, she said, "There's a lot of joy in watching them." Of farm life as a whole: "There's a lot of peace and a lot of satisfaction. There's something in just watching the grass grow."